Astrocytes have prominent roles in central nervous system (CNS) function and disease, with subpopulations defined primarily by morphologies and molecular markers often determined in cell culture. Here, we identify an in vivo astrocyte subpopulation termed immediate-early astrocytes (ieAstrocytes) that is defined by functional c-Fos activation during CNS disease development. An unbiased screen for CNS cells showing c-Fos activation during experimental autoimmune encephalomyelitis (EAE), a mouse model for multiple sclerosis (MS), was developed by using inducible, TetTag c-Fos reporter mice that label activated cells with a temporally stable, nuclear green fluorescent protein (GFP). 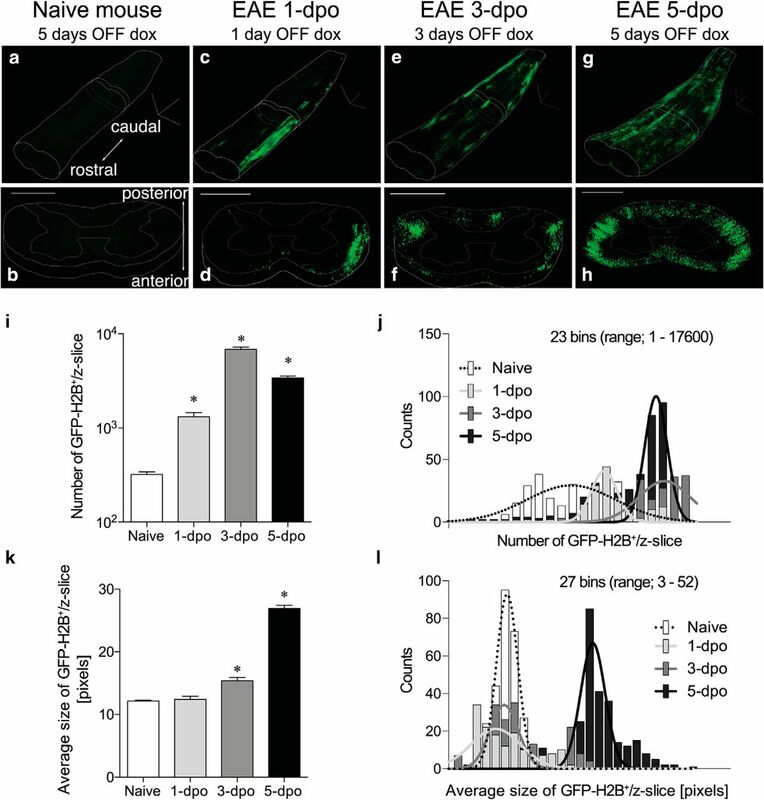 Four-dimensional (3D over time) c-Fos activation maps in the spinal cord were produced by combining tissue clearing (iDISCO) and confocal microscopy that identified onset and expansion of GFP+ cell populations during EAE. More than 95% of the GFP+ cells showed glial fibrillary acidic protein (GFAP) immunoreactivity—in contrast to absent or rare labeling of neurons, microglia, and infiltrating immune cells—which constituted ieAstrocytes that linearly increased in number with progression of EAE. ieAstrocyte formation was reduced by either astrocyte-specific genetic removal of sphingosine 1-phosphate receptor 1 (S1P1) or pharmacological inhibition by fingolimod (FTY720), an FDA-approved MS medicine that can functionally antagonize S1P1. ieAstrocytes thus represent a functionally defined subset of disease-linked astrocytes that are the first and predominant CNS cell population activated during EAE, and that track with disease severity in vivo. Their reduction by a disease-modifying agent supports their therapeutic relevance to MS and potentially other neuroinflammatory and neurodegenerative diseases. 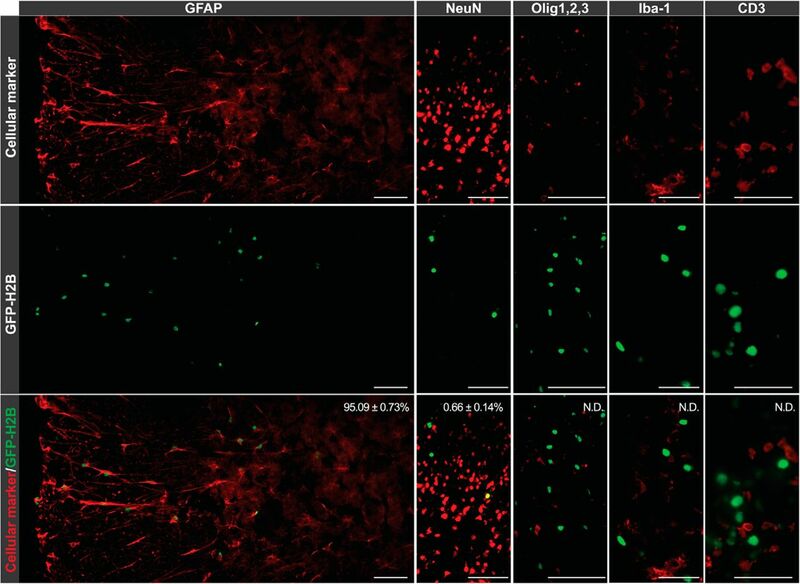 A new, functionally defined in vivo subpopulation of astrocytes termed immediate-early astrocytes (ieAstrocytes) was identified as the first and predominant CNS cell type showing c-Fos activation, in an animal model of multiple sclerosis (MS). ieAstrocytes track with disease severity. The approved MS drug fingolimod (FTY720, an S1P receptor modulator) reduced ieAstrocyte formation as well as clinical disease. Agents that prevent or reduce ieAstrocytes could represent a new strategic target for treating MS and other neuroinflammatory and neurodegenerative brain disorders. Neuroinflammation in the central nervous system (CNS), as epitomized by multiple sclerosis (MS), involves activation of resident immune-competent cells, including astrocytes (Cekanaviciute and Buckwalter, 2016), along with infiltration of peripheral immune cells (González and Pacheco, 2014), which have been associated with multiple CNS pathologies such as MS (Noseworthy et al., 2000), Alzheimer’s disease (Acosta et al., 2017), and neuropsychiatric disorders (Trepanier et al., 2016). MS is a prototypical neuroinflammatory disease that also includes demyelination and neurodegeneration in the CNS (Noseworthy et al., 2000). Its cause is unclear; however, in animal models such as experimental autoimmune encephalomyelitis (EAE), immune cells, particularly CD4+ T cells, infiltrate the CNS to initiate demyelination and neurodegeneration. Both EAE and human MS can be therapeutically treated by the FDA-approved medicine fingolimod (FTY720; Herr and Chun, 2007; Chun and Hartung, 2010; Lee et al., 2010; Chun and Brinkmann, 2011; Noguchi and Chun, 2011). FTY720 is a chemical analog of a naturally occurring lipid, sphingosine. It can be phosphorylated by endogenous sphingosine kinases to produce FTY720-phosphate (FTY720-P), an analog of the bioactive lysophospholipid known as sphingosine 1-phosphate (S1P). S1P signals through five receptor subtypes (S1P1–5), all of which are G protein-coupled receptors (GPCRs; Kihara et al., 2014) that can have roles in neuroinflammation (Gardell et al., 2006; Herr and Chun, 2007; Moon et al., 2015; Proia and Hla, 2015; Tsai and Han, 2016). FTY720-P also signals through S1P receptors, engaging four of the five known subtypes (S1P1, S1P3, S1P4, and S1P5; Kihara et al., 2015). In particular, S1P1 is thought to be mechanistically important in MS in that a functional antagonism of S1P1 reduces lymphocyte egress from secondary lymphoid organs, resulting in a decreased number of pathogenic lymphocytes entering the CNS (Mandala et al., 2002; Arnon et al., 2011). Complementing these immune effects, a direct CNS mechanism of action (MOA) for fingolimod has been implicated (Choi et al., 2011), which also involves functional antagonism of S1P1 expressed by astrocytes, based on similar results observed following the genetic removal of S1P1 from astrocytes, which both resulted in reduced EAE severity and elimination of FTY720 efficacy, despite intact lymphocyte trafficking effects (Choi et al., 2011). S1P signaling is also implicated in controlling astrocyte functions that include gap junction formation (Rouach et al., 2006), migration (Mullershausen et al., 2007), cytokine production (Dusaban et al., 2017), and nitric oxide production (Colombo et al., 2014) via S1P1 and/or S1P3, all of which support S1P-mediated roles for astrocytes in EAE and MS.
To identify CNS cell types altered during neuroinflammatory processes, we developed an unbiased in vivo screen based on transcription of c-Fos (Bullitt, 1990), an immediate-early gene (IEG) that is rapidly transcribed in response to cellular stimuli, independent of de novo protein synthesis (Lau and Nathans, 1987). c-Fos can be activated in astrocytes (McNaughton and Hunt, 1992; Anderson et al., 1994; Morishita et al., 2011; Yester et al., 2015), microglia (Eun et al., 2004), and oligodendrocytes (Muir and Compston, 1996), as well as within neurons associated with memory (Matsuo et al., 2008). We adapted a conditional c-Fos reporter mouse that historically marks cells with nuclear GFP, which could be followed in four-dimensional (3D over time) analyses. Remarkably, more than 95% of disease-activated cells in vivo were astrocytes that we named immediate-early astrocytes (ieAstrocytes). Here, we describe the in vivo screen used to identify the ieAstrocytes produced by EAE challenge, including their temporal and spatial patterns and their quantitative modification by S1P receptor signaling, demonstrated through the use of genetic and pharmacological interventions. All animal protocols were approved by the Sanford Burnham Prebys Medical Discovery Institute IACUC and conformed to National Institutes of Health guidelines and public law. The TetTag-cFos mice were generated by crossing Tg(Fos-tTA)1Mmay (MGI:5014071) and Tg(tetO-HIST1H2BJ/GFP)47Efu/J (RRID:IMSR_JAX:005104) mice, which expressed a GFP-histone H2B fusion protein (GFP-H2B) under a tetO promoter controlled by a c-Fos inducible tetracycline transactivator (tTA) protein as described earlier (Tayler et al., 2011). 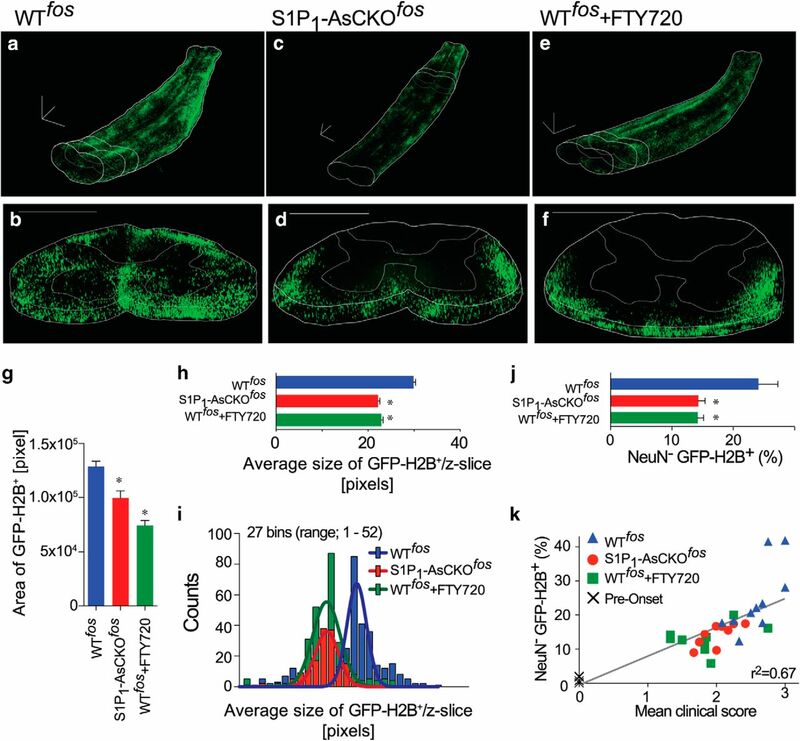 S1P1 flox/flox:hGFAP-cre mice (Choi et al., 2011) were crossed with TetTag mice for multiple generations to generate astrocyte-specific S1P1 deletion (S1P1-AsCKOfos, TetTag:S1P1 flox/flox:hGFAP-cre) and their littermate controls (WTfos, TetTag:S1P1 flox/flox). TetTag-cFos mice were maintained on doxycycline diet (DOX, 40 mg/kg; Bio-Serv) throughout breeding, birth, and development to prevent GFP-H2B expression until experimental examination. EAE was induced in 7- to 13-wk-old female mice (Kihara et al., 2009). Briefly, mice were immunized subcutaneously with 150 µg myelin oligodendrocyte glycoprotein 35–55 (MOG35–55) (MEVGWYRSPFSRVVHLYRNGK, EZBiolab) in PBS and complete Freund’s adjuvant containing 4 mg/mL M. Tuberculosis H37Ra (Difco) with or without intraperitoneal injection of 250 ng pertussis toxin (List Biological Laboratories) on days 0 and 2. Daily clinical scores corresponding to the most severe sign observed were given as follows: 0, no sign; 0.5, mild loss of tail tone; 1.0, complete loss of tail tone; 1.5, mildly impaired righting reflex; 2.0, abnormal gait and/or impaired righting reflex; 2.5, hindlimb paresis; 3.0, hindlimb paralysis; 3.5, hindlimb paralysis with hind body paresis; 4.0, hind- and forelimb paralysis; and 4.5, death or severity necessitating euthanasia. FTY720 was administered via gavage (1 mg/kg; Novartis). Mice were euthanized with an overdose of isoflurane followed by rapid dissection of spinal cords (SCs). SCs were cut in three sections, embedded in Tissue-Tek Optimal Cutting Temperature (OCT; Ted Pella) compound, and frozen on crushed dry ice. Cryostat sections (16 μm) were collected on Superfrost Plus microscope slides (Thermo Fisher Scientific) and fixed (10 min) with freshly prepared 4% paraformaldehyde (PFA; Sigma) in PBS. Sections were washed three times in TBS with 0.3 M glycine, permeabilized with 0.1% Triton X-100 in TBS, blocked with species-appropriate serum, and immunolabeled with chicken anti-GFAP (1:1000 dilution, Neuromics, Cat #CH22102, RRID:AB_10014322), rabbit anti-NeuN (1:400 dilution, Millipore, Cat #MABN140, Clone #27-4, RRID:AB_2571567), mouse anti-Olig1,2,3 (1:100 dilution, Neuromics, Cat #MO15059, Clone #257224, RRID:AB_1620409), rabbit anti-Iba1 (1:500 dilution, Wako, Cat #019-19741, Clone #NCNP24, RRID:AB_839504), and hamster anti-CD3e (1:500 dilution, BD Biosciences, Cat# 553057, Clone #145-2C11, RRID:AB_394590). Antigen retrieval with Diva Decloaker (Biocare) as per manufacturer’s instructions was performed in place of permeabilization for Olig1,2,3 staining. Sections were washed in PBS, labeled with secondary antibodies conjugated with Alexa Fluor 568 (1:2000 dilution, Thermo Fisher Scientific; Cat# A-11041, RRID:AB_2534098; Cat# A-11031, RRID:AB_144696; Cat# A-11036, RRID:AB_10563566) or DyLight 649 (1:2000 dilution, BioLegend, Cat# 405505, RRID:AB_1575122), counterstained with DAPI (1:10,000 dilution, Thermo Fisher Scientific, Cat# D1306, RRID:AB_2629482), and coverslipped with Vectashield Antifade Mounting Medium (Vector). Sections were visualized and images acquired on a Zeiss Imager 1D microscope (Axiovision 4.8, RRID:SCR_002677), a Zeiss ApoTome.2 (Zen 2 Blue Edition, RRID:SCR_013672), or a Nikon A1+ (NIS-Elements v4.4, RRID:SCR_014329). Immunolabeling-enabled three-dimensional imaging of solvent-cleared organs (iDISCO) was employed to visualize GFP-H2B in intact SCs (Renier et al., 2014). Mice were euthanized with an overdose of isoflurane anesthesia, then fixed by intracardiac perfusion of PBS followed by 4% PFA in PBS. SCs were dissected out and postfixed overnight in 4% PFA in PBS; washed in PBS, 50% methanol in PBS, 80% methanol in PBS, and 100% methanol; and bleached in 20% DMSO in methanol containing 5% H2O2 at 4°C. Samples were washed again in 100% methanol, 20% DMSO in methanol, 80% methanol in PBS, 50% methanol in PBS, PBS, and PBS containing 0.2% Triton X-100 and incubated at 37°C in PBS containing 0.2% Triton X-100/20%DMSO/0.3 M glycine. Samples were blocked in PBS containing 0.2% Triton X-100/10% DMSO/6% goat serum at 37°C, washed in PBS containing 0.2% Tween 20 and 10 µg/ml heparin (PTwH), and incubated in a rabbit anti-GFP antibody (1:1000 dilution, MBL International Cat# 598, RRID:AB_591819) in PTwH at 37°C. Samples were washed in PTwH, then incubated in anti-rabbit Alexa Fluor 488 (1:1000 dilution, Thermo Fisher Scientific Cat# A-11008, RRID:AB_143165). Samples were washed again in PTwH before tissue clearing. SC samples were incubated in 50% v/v tetrahydrofuran/H2O (THF, Sigma), 70% THF in H2O, 80% THF in H2O, 100% THF, dichloromethane (Sigma), and finally dibenzyl ether (DBE). Cleared SCs were placed in a microscope chamber made with two to three stacked Fastwells (Research Products International), filled with DBE, and coverslipped. The intact SCs were imaged on a Nikon A1+ confocal microscope using z-steps of 10 µm under 10× objective. NIS-Elements (v4.3, RRID:SCR_014329) was used to three-dimensionally reconstruct the entire SC. Obtained images were analyzed with ImageJ (NIH, RRID:SCR_003070) to count the number of signals, areas, and average area of signals. SCs were rapidly dissected and frozen in liquid nitrogen. Samples were equilibrated to 4°C and dounce-homogenized in a nucleus extraction buffer made with 0.32 M sucrose/5 mM CaCl2/3 mM Mg(CH3COO)2/0.1 mM EDTA/20 mM Tris-HCl, pH 8.0/0.1% Triton X-100 in DEPC-treated H2O. Homogenized samples were filtered (50 μm; Celltrics, Sysmex) and washed in DEPC-treated PBS containing 2 mM EDTA (PBSE-d). Nuclei were purified by centrifugation at 3250 × g for 12 min in an isosmotic iodixanol gradient made of a 35%, 10%, and 5% OptiPrep (Sigma) in DEPC-treated H2O containing 20 mM tricine-KOH (pH 7.8), 25 mM KCl, and 30 mM MgCl2 (Graham, 2001). Nuclei were recovered in the 35%-10% interface, washed in PBSE-d, and immunolabeled with rabbit anti-NeuN antibody (1:400 dilution, Millipore, Cat #MABN140, Clone #27-4, RRID:AB_2571567) in 1% bovine serum albumin (BSA)/PBSE-d for 20 min. Samples were washed in PBSE-d and labeled with a goat anti-rabbit APC-conjugated secondary antibody (1:500 dilution, Thermo Fisher Scientific, Cat# A10931, RRID:AB_10562534) and DAPI (1:5000 dilution, Thermo Fisher Scientific, Cat# D1306, RRID:AB_2629482) in 1%BSA/PBSE-d for 10 min. Samples were washed in PBSE-d and suspended in PBSE-d. Nuclear populations were analyzed and sorted on a BD FACSAria II. Gating was performed as follows: (1) DAPI positive, (2) size and granularity consistent with nuclei by forward-scatter area (FSC-A) and side-scatter area (SSC-A), and (3) single nuclei selected by both FSC-A and forward-scatter height (FSC-H) and SSC-A and side-scatter height (SSC-H). Analysis was performed on FlowJo (10.0.8r1, RRID:SCR_008520). Results are expressed as means ± SEM. Data were analyzed statistically by means of ANOVA with indicated post hoc tests as appropriate, using GraphPad PRISM software (RRID:SCR_002798). Values of p < 0.05 were considered to be statistically significant. We hypothesized that EAE would induce c-Fos expression in key, disease-relevant cells. An unbiased screen was developed using the c-Fos-inducible and doxycycline-regulated TetTag cFos system that labels cell nuclei with GFP permanently (Fig. 1a). This system was used previously to identify neurons involved in learning and memory (Matsuo et al., 2008). TetTag cFos reporter mice, immunized with MOG35–55 peptide, showed robust GFP signals in the SC 5 d after removal of doxycycline (Fig. 1). The increase was detected only in symptomatic EAE mice (Fig. 1c), indicating that EAE insults produced c-Fos activation in the CNS. To understand the spatio-temporal c-Fos activation pattern, EAE SCs were processed by a tissue-clearing technique, iDISCO (Renier et al., 2014), combined with serial confocal images (Fig. 2a–h; Videos 1–7). Control SC from naive mice displayed sparse GFP signals even 5 d after doxycycline removal (Video 1). After 1 d post-onset (1 dpo), GFP+ nuclei appeared in the periphery of white matter tracts near associated blood vessels (Video 2). The GFP signals expanded along the rostral-caudal axis and penetrated into the white matter parenchyma over time, appearing most prominently near anatomically known major blood vessels including the anterior, posterior, and posterolateral spinal vessels (Fig. 2, Videos 3 and 4). Importantly, the number of GFP+ nuclei (Fig. 2i, j) and the average size of GFP+ signals (Fig. 2k, l) increased significantly over time, revealing that GFP+ nuclei aggregated to form clusters in EAE SCs at 5 dpo. These results identified robust c-Fos activation in cells near major CNS blood vessels in peripheral white matter tracts, followed by inward expansion centrally, into gray matter. c-Fos reporter mice display increased c-Fos activation in EAE spinal cords (SCs). a, Schematic representation of doxycycline (dox)-controlled GFP-H2B expression. Dox removal (off dox) allows tTA (tetracycline-transactivator) expression under a c-Fos promoter to drive fused green fluorescent protein-human histone H2B (GFP-H2B) expression. b, Experimental scheme of 5-d dox removal period. Average onset of EAE in WTfos controls was 10.6 ± 1.07 days postimmunization (dpi; n = 7). c, GFP-H2B+ population in the spinal cord was determined by FCM (n = 4 animals, mean ± SEM, *p < 0.05, one-way ANOVA with Bonferroni’s post hoc test). d–l, Representative spinal cord coronal sections. In the naive SC, DOX inhibited extra-experimental tagging of GFP+ cells. Virtually no GFP-H2B was observed (d–f). On DOX removal, there were sparse and dispersed GFP+ cells in the naive SC over 5 d (g–i). EAE induced robust GFP signals in the SC at 5 days post-onset (dpo) that were clustered in lesions and along the periphery (j–l). Scale bar, 500 μm. c-Fos activation is temporally and spatially propagated in EAE SC. a–h, Representative 3D imaging of lower (lumbar region) SCs in naive (a and b) and EAE-induced reporter mice of 1 (c and d), 3 (e and f), and 5 (g and h) days post-onset (dpo, n = 2–5 animals for each dpo). a, c, e, g, 3D-reconstructed images. b, d, f, h, Coronal sections. Scale bar, 500 μm. i, The number of GFP-H2B+ nuclei in the SCs (mean ± SEM, *p < 0.001 versus naive, Kruskal–Wallis test with Dunn’s post hoc test, data were compiled from 273, 149, 185, and 381 z-slices from 3, 2, 2, and 4 animals, respectively). j, Distribution of the number of GFP-H2B+ nuclei per z-slice as shown in i. Lines represent Gaussian fits to the data. k, Average size of GFP-H2B+ signals (mean ± SEM, *p < 0.001 versus naive, Kruskal–Wallis test with Dunn’s post hoc test, data were compiled from 273, 149, 185, and 381 z-slices from 3, 2, 2, and 4 animals, respectively). l, Distribution of the average size of GFP-H2B+ signals per z-slice shown in k. Lines represent Gaussian fits to the data. 3D video of control spinal cord shown in Fig. 2a, b. 3D video of EAE spinal cord at 1 dpo shown in Fig. 2c, d.
3D video of EAE spinal cord at 3 dpo shown in Fig. 2e, f.
3D video of EAE spinal cord at 5 dpo shown in Fig. 2g, h.
3D video of WTfos EAE spinal cord at 5 dpo shown in Fig. 4a, b. 3D video of S1P1-AsCKOfos EAE spinal cord at 5 dpo shown in Fig. 4c, d.
3D video of FTY720-treated WTfos EAE spinal cord at 5 dpo shown in Fig. 2e, f.
To determine the identities of GFP+ cell types, immunolabeling for various cellular markers was performed on 5-dpo SC sections. Strikingly, a vast majority of GFP+ nuclei (95.09 ± 0.73%, n = 3) were found to colabel with glial fibrillary acidic protein (GFAP; Fig. 3). By contrast, <1% of GFP+ nuclei (0.66% ± 0.14%, n = 3) colocalized with a neuronal nuclear marker (NeuN). Other assessed cell types included microglia, oligodendrocytes, and T lymphocytes, none of which showed colocalization with GFP signals (Fig. 3), whereas GFP+CD3+ T cells were found outside of the CNS within the peripheral lymph nodes of EAE mice, demonstrating their ability to report c-Fos (data not shown). 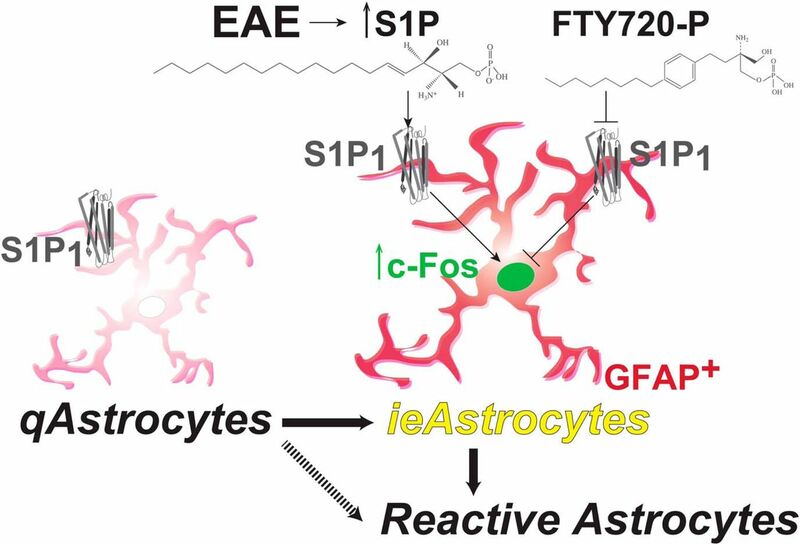 The dominance of EAE-induced GFP+ astrocytes that reported transcription of the c-Fos IEG during disease development supported a functional classification for these astrocytes, which were therefore called immediate-early astrocytes (ieAstrocytes). At any given time following EAE challenge, ieAstrocytes could be distinguished from cells that did not show evidence of c-Fos activation, quiescent astrocytes (qAstrocytes). Immunolabeling identifies astrocytes as major c-Fos-activated cells in EAE SC. Immunolabeling for GFAP, NeuN, Olig1,2,3, Iba1, CD3, and GFP on SC sections, as indicated. Percentage overlap as indicated. N.D., not detected. n = 3 animals. Scale bar, 100 μm (GFAP, NeuN, and Olig1,2,3) and 50 μm (Iba-1 and CD3). Lower-magnification view of GFAP stained WTfos EAE spinal cords. Immunolabeling identified astrocytes as the primary cell type in c-Fos–activated cells in EAE SC. Scale bar, 500 μm. Download Figure 3-1, JPG file. To test whether S1P1 signaling influenced formation of ieAstrocytes, we crossed astrocyte-specific S1P1-KO mice (S1P1-AsCKO; S1P1 flox/flox mice harboring human GFAP promoter-driven Cre transgene; Choi et al., 2011) with the TetTag-c-Fos reporter mice to produce S1P1-AsCKOfos (S1P1-AsCKO × TetTag/S1P1 flox/flox) and WTfos (TetTag/S1P1 flox/flox) mice, which were then challenged with EAE. For the FTY720 treatment group, FTY720 (1.0 mg/kg) was orally administered from defined dpo (dpo = 0, clinical score ≥ 1.0). GFP+ signals at 5 dpo in S1P1-AsCKOfos and FTY720-treated WTfos (WTfos+FTY720) mice were attenuated compared with WTfos controls (Fig. 4a–f and Videos 5–7). GFP+ signals were observed in gray matter of WTfos controls (Fig. 4b and Video 5), while they were rarely found in S1P1-AsCKOfos and WTfos+FTY720 mice (Fig. 4d, f and Videos 6 and 7). These were accompanied by a significant loss of ieAstrocyte numbers (Fig. 4 g) and the ieAstrocyte clusters (Fig. 4h, i) in S1P1-AsCKOfos and WTfos+FTY720 mice compared with WTfos controls. Flow cytometric (FCM) analysis of ieAstrocytes (DAPI-gated, NeuN–GFP+ populations) from the SCs of EAE mice revealed a significant decrease of ieAstrocytes (Fig. 4j) and a linear correlation of increasing ieAstrocytes with worsening clinical scores (Fig. 4k). These results link ieAstrocyte formation to EAE disease progression, both of which can be modified by S1P1 signaling. Genetic and pharmacological removal of S1P1 suppresses ieAstrocyte formation. a–f, Representative 3D imaging of lower (lumbar region) SCs in EAE-induced WTfos (a and b), S1P1-AsCKOfos (c and d), and WTfos+FTY720 (e and f) mice of 5 dpo (dpo). a, c, e, 3D-reconstructed images. b, d, f, Coronal sections. Scale bar, 500 μm. g, Area of GFP-H2B+ signals in the spinal cords (mean ± SEM, data were compiled from 303, 151, and 273 z-slices from n = 3, 2, and 3 animals, respectively, *p < 0.01 versus WTfos, Kruskal–Wallis test with Dunn’s post hoc test). h, Average size of GFP-H2B+ signals (mean ± SEM, *p < 0.001 versus WTfos, Kruskal–Wallis test with Dunn’s post hoc test, data were compiled from 303, 151, and 273 z-slices from 3, 2, and 3 animals, respectively). i, Distribution of the average size of GFP-H2B+ signals per z-slice shown in h. Lines represent Gaussian fits to the data. j, ieAstrocyte (NeuN–GFP+) populations in EAE SCs were determined by FCM (mean ± SEM, n = 10, 9, and 9 animals, *p < 0.05 versus WTfos by one-way ANOVA with Bonferroni’s multiple comparisons test). k, Correlation between ieAstrocyte (NeuN–GFP+) populations and clinical score. Each point represents a single animal. The present study identified a functionally defined in vivo population of astrocytes, ieAstrocytes, as the earliest and predominant cell type responding to EAE insult. Surprisingly, other cell types were not functionally activated to a similar extent within the CNS. Moreover, ieAstrocyte formation increased with disease severity, and in part required S1P-S1P1 signaling. IEGs as typified by c-Fos have been used as functional markers of cellular activation (Herrera and Robertson, 1996), particularly in the nervous system, where c-Fos was used as a transynaptic marker for neuronal activity (Bullitt, 1990), and most commonly relied on immunolabeling. In the present study, we used a TetTag c-Fos reporter system that is remarkable in tracking historical neural activity by labeling cells with stable GFP, compared with merely capturing momentary snapshots by classical c-Fos immunolabeling. This system historically traced the cells that experienced c-Fos expression during challenges, which identified a functional subset of neurons in learning and memory (Matsuo et al., 2008; Tayler et al., 2011) and functional astrocytes in EAE (Fig. 2). Although several studies identified c-Fos immunoreactivity in neurons with exclusion of c-Fos expression in astrocytes (Staiger et al., 2002; Wang et al., 2009; Lecrux et al., 2011), it was demonstrated in cultured astrocytes stimulated with excitatory amino acids (McNaughton and Hunt, 1992) and S1P (Yester et al., 2015), as well as in in vivo astrocytes, such as in electrical sensorimotor cortex stimulation (Morishita et al., 2011) and Alzheimer’s brains (Anderson et al., 1994). Moreover, results from direct activation of engineered Gαi-coupled GPCRs expressed in in vivo astrocytes using designer receptors exclusively activated by designer drugs (DREADDs; Chai et al., 2017), concur with our results that Gαi-coupled S1P1 signaling functionally activates c-Fos in astrocytes in vivo (Fig. 3). Astrocytes are the most abundant cells in the CNS (Burda and Sofroniew, 2014; Farmer and Murai, 2017). They have been widely considered as bystanders in neuroinflammatory diseases (Rossi et al., 2007), responding secondarily under disease conditions to become reactive astrocytes that were originally defined by their hypertrophic morphology and increased GFAP expression, compared with quiescent qAstrocytes (Burda and Sofroniew, 2014; Hubbard and Binder, 2016). A recently proposed classification of A1 reactive astrocytes added transcriptomic signatures to the reactive astrocyte populations (Liddelow et al., 2017). By contrast, ieAstrocytes are defined (1) functionally (via c-Fos expression) and (2) temporally (in vivo during EAE development and progression) (Fig. 4). Considering the nature of immediate-early and transient c-Fos expression (Herrera and Robertson, 1996), ieAstrocytes appear to differ from reactive astrocytes, possibly representing an intermediate/transition state between qAstrocytes and reactive astrocytes, which moreover is partly driven by S1P signaling (Fig. 4). A possible scenario is that during EAE development, blood-borne S1P carried by albumin and apolipoprotein M (Blaho et al., 2015) at sufficient concentrations (∼µm) to activate S1P receptors (Tsai and Han, 2016) extravasates across a disrupted blood-brain barrier (Alvarez et al., 2011) to reach perivascular astrocytes in the spinal cord (Fig. 2 and Videos 1–7), resulting in direct activation of qAstrocytes to initiate ieAstrocyte formation. An alternative, but not mutually exclusive scenario, is the formation of A1 reactive astrocytes requiring microglial cytokine production (IL-1α, TNFα, and C1q) to activate astrocytes secondarily (Liddelow et al., 2017), to give rise to both ieAstrocytes and reactive astrocytes. The determination of the involved activation pathways will require further study. Therapeutic reduction of S1P1 signaling is thought to reduce pathogenic lymphocyte trafficking into the brain, which has been proposed as the immunologic MOA of fingolimod (Mandala et al., 2002; Chun and Hartung, 2010; Arnon et al., 2011; Cohen and Chun, 2011; Chun et al., 2018). However, a direct CNS MOA involving astrocytes (Choi et al., 2011; Groves et al., 2013) receives further support through the dominant presence of ieAstrocytes, whose increasing numbers correlated with disease severity (Fig. 4k), and from the fact that genetic removal or pharmacological inhibition by fingolimod of S1P1 signaling (Choi et al., 2011; Groves et al., 2013) reduced both ieAstrocytes and disease severity. Notably, complete S1P1 removal did not eliminate ieAstrocytes, indicating that other factors must be involved in their activation. In this light, other MS drugs that have been proposed to access a direct CNS MOA distinct from S1P receptor modulation in EAE, including interferon β (Rothhammer et al., 2016) and dimethyl fumarate (Al-Jaderi and Maghazachi, 2016), might also reduce ieAstrocyte formation. Although these relationships remain to be determined, they theoretically support combination therapies that could more completely prevent ieAstrocyte formation. A next-generation S1P receptor modulator, siponimod (BAF312), that also engages S1P1 (and S1P5), showed positive results in a phase III secondary progressive MS trial (Kappos et al., 2018), which is consistent with a CNS MOA involving ieAstrocytes, while other related agents like ozanimod (Cohen et al., 2016), etrasimod (Buzard et al., 2014), and ponesimod (Bolli et al., 2010; Vaclavkova et al., 2014)—having similar, albeit distinct, S1P receptor engagement properties—may also have direct CNS effects in MS through ieAstrocytes. Overall, our results support a previously unrecognized pathogenic role of functionally defined astrocytes in vivo, which could reveal new disease mechanisms and therapeutic targets accessed through ieAstrocytes. Acknowledgments: We thank K. Spencer (The Scripps Research Institute) for assistance with microscopy; V. Brinkmann and Novartis for gifts of FTY720 and discussions; L. Boyd (Sanford Burnham Prebys Medical Discovery Institute), J. Wong, H. Mirendil, and all the lab members for discussions; and D. Jones for editorial assistance. J.C. has received honoraria, consulting fees, and grant support from Novartis. All other authors declare no competing financial interests. This work was supported by a grant from NIH DA019674 and NS084398 (J.C.) and Novartis (J.C.), NIH NS103940 (Y.K.) a fellowship from the Uehara Memorial Foundation, the Kanae Foundation for the Promotion of Medical Science, Mochida Memorial Foundation for Medical and Pharmaceutical Research, and the Human Frontier Science Program (Y.K.). A.G was supported by Medical Scientist Training Program and Pharmacology Training Grant at University of California San Diego (T32GM007752). Chun J, Brinkmann V (2011) A mechanistically novel, first oral therapy for multiple sclerosis: the development of fingolimod (FTY720, Gilenya). Discov Med 12:213–228. Chun J, Kihara Y, Jonnalagadda D, Blaho VA (2018) Fingolimod: lessons learned and new opportunities for treating multiple sclerosis and other disorders. Ann Rev Pharmacol Toxicol, in press. Graham JM (2001). Isolation of nuclei and nuclear membranes from animal tissues. In Current Protocols in Cell Biology. Hoboken, NJ: Wiley. Hubbard AJ, Binder DK (2016). Chapter 1. History of astrocytes. In Astrocytes and Epilepsy. Cambridge, MA: Academic Press, pp. 1–38. While both reviewers have found that the manuscript presents novel and interesting results that will be will inform future efforts for the treatment of neuroinflammatory diseases. They, however, expressed some minor concerns. I concur with their assessments and I also believe that addressing these minor issues, which seems to be feasibly done in a reasonable short time, will enhance the strength of the manuscript. I am looking forward to receiving a revised version of the manuscript. This manuscript identifies a population of astrocytes that express c-Fos upon the induction of inflammation (in the context of EAE), and shows that c-Fos activation is reduced upon loss of S1P1 signaling. The results will inform efforts to treat neuroinflammatory disease using a panoply of drugs that modulate S1P signaling. This manuscript describes c-Fos activation in a subpopulation of astrocytes upon inflammation (EAE), and demonstrates that c-Fos activation is regulated by S1P1 signaling in astrocytes. The results will inform efforts to treat neuroinflammatory disease using a panoply of drugs that modulate S1P signaling. 1. Fig. 1c: Please define n=4 -- 4 mice or 4 sections (or is this done by flow cytometry)? In all cases, compilations should include more than one mouse. 1. Fig. 2i: The compilation should show more than one mouse for each timepoint. 2. Fig. 2j: How is ‘Cluster formation (%)’ defined? Also what data are compiled in the bar graph? 3. Fig 3: What data are compiled to calculate the mean/SEM? 4. Fig. 4g-i: What is being compiled? The study advances our knowledge on the signaling cascades associated with the EAE model of MS. The authors highlight the early activation of fos primarily in astrocytes. Using an advanced genetic tool, they functionally characterize a subpopulation of reactive astrocytes in the spinal cord, which could be a target for future research. The manuscript “A functionally defined in vivo astrocyte population identified by c-Fos activation in a mouse model of multiple sclerosis modulated by S1P signaling: immediate-early astrocytes (ieAstrocytes)” describes an interesting study. Using an advanced genetic tool, the authors convincingly show that EAE-mediated activation of c-fos in the spinal cord primarily occurs in astrocytes (95 %). 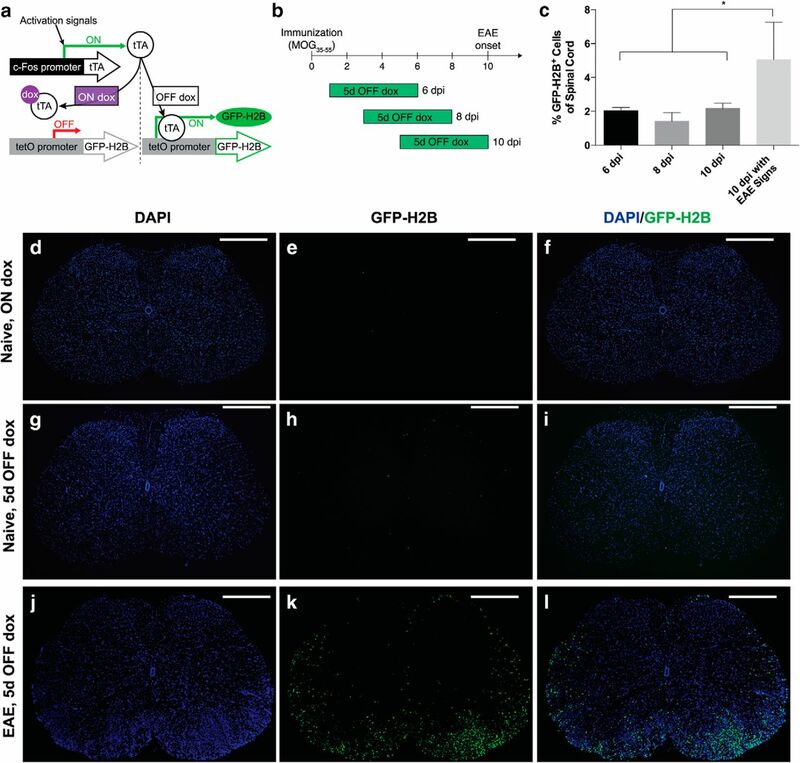 In addition, the authors provide additional data suggesting that S1P receptor signaling modulates the astroglia activation. In general, the study is carefully performed and well written. The results will be helpful to the community working on MS. In all figures, the use of blue or green colors on a black background is contra-productive, Well, DAPI is regarded as blue and GFP as green, but the signal is detected by an opto-electronic sensor. The color afterwards depends on the color look-up table. Please use grey and for the single channels and the data will be much easier recognized by the reader. Also the movies should be in presented with a grey scale LUT. The results largely depend on figure 3, upper left image. Please provide complete overviews of the spinal cord in which also white and grey matter areas can be distinguished.